Thanks to Victoria’s Cafe Bistro and Trolley Line Bookshop in Rogers, Arkansas for hosting the Saturday Signing “Books & Brunch” event yesterday. 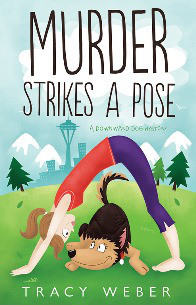 We had a terrific turnout, and I loved getting to meet so many fans of my Waterside Kennels mystery series. Cafe owner Victoria Christie provided the perfect venue for a cozy book signing and generously set up a space right by the door and visible to anyone passing by. (The food was fantastic, too!) Myra Moran, owner of the Trolley Line Bookshop, was the perfect hostess, making sure everyone was welcomed and introduced. We had a veritable parade of librarians, dog lovers of all sorts, cat lovers, writers, neighbors, and colleagues. Perfect! A highlight of the day for many appeared to be talking about the treasure tales and regional stories that came to life in the book. And watching people waiting for a signed copy of my book was an incredible experience I’ll probably never forget. Thank you, everyone, for a glorious day! Food, books, and friends—what could be better on a winter’s day? 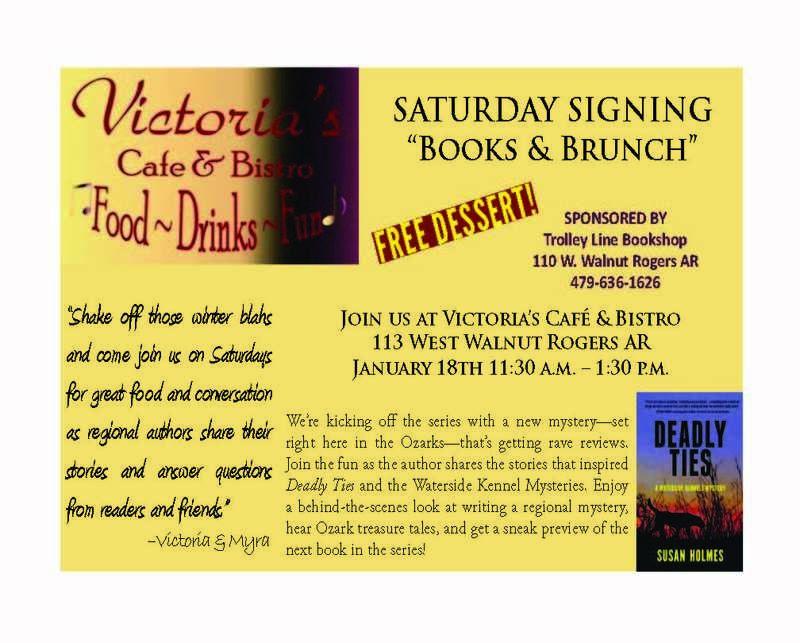 The owners of Victoria’s Cafe & Bistro and the Trolley Line Bookshop have teamed up to host the “Saturday Signing: Books & Brunch” series in historic downtown Rogers, Arkansas. I’m honored to announce they’re kicking off the series on January 18th with my book, Deadly Ties (A Waterside Kennels mystery). My thanks to Victoria Christie and Myra Moran for this special event. If you’re in the area, I hope you’ll come by and join in the fun!